If you read this column for Club History than this issue has got it. For the first time in 100 years we have details and Photos of the golf course that was on the property from 1912-1922. The original history project of our Club began in 1989 when we tried to research the golf course. We eventually recovered maps, photos and drawings that proved that Donald Ross completely redesigned this course in 1922. Those discoveries lead to the golf course restoration project and the design work by Ross restoration expert, Ron Forse in 2001-2002. But what of the first course that was on the property from 1912-1922? New research has uncovered quite a lot that has been lost for 100 years. 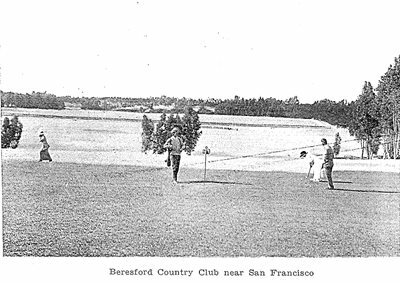 The first course at the Beresford CC was designed by Thomas Bendelow. Bendelow was a prolific architect, designing over 500 courses in his lifetime. He was on site to design Beresford. I found a newspaper clipping dated Dec.24 1911 saying he was touring the property and a local store receipt dated a few days later billing him for an axe. The course was laid out and opened for play July 4. 1912. The course played "clockwise" (up the hill on what is now the 5th hole). The greens were bent grass and had sub surface drainage and the tees were manicured. The fairways were not much more than fields and had little or no definition. There were a few bunkers and the early course had copses (dirt mounds that resembled chocolate drops). We had not yet purchased the Casey Property to the North that would someday become the eleventh hole. 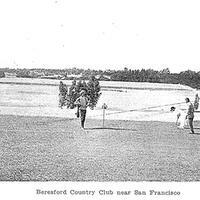 We did own the land in front of the Clubhouse all the way down to Alameda and the golf course played down there. There were two other note able features from the Beresford-Bendelow course of 1912-1922: There were almost no trees on the property. There was a double row of Eucalyptus (edge of current driving range). An old road leading to an old cottage near the site of the tennis courts ran through the trees. There were also a few fruit trees which survived decades later near the 11th green. There were also two open creeks, one which came from #1 and the other from # 4 and the connected and ran across what is now # 1, 10, &18. The creeks were open and were a hazard. The first hole of the course played from the edge of the road, about where the bag drop is today, across the open creek and uphill to a green site about where the top of the tenth fairway is today. The second hole played back in the direction of the current 18th fairway. The second green at the time was where the 18th green is today. I've attached two photos not been seen for about 100 years. 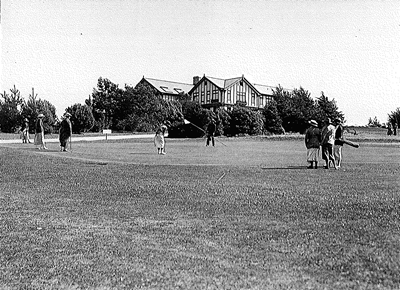 The first, from 1913 shows the second green (now #18) looking down the fairway. The flagstick is four foot tall. You can just see a footbridge over the creek at the bottom of the hill. Looking North there seems to be plenty of open land. 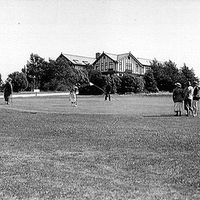 The second picture of this green was probably taken around 1921. The trees around the Clubhouse are very mature (it was just finished in. 1915). Bob Kearn helped identify this hole by counting the windows in the Clubhouse (More about that in Part II). The small road behind the green is actually Madera Drive. Next issue-more photos and history and we try and answer the question, did Harry Vardon play golf here?